out is one the implicit object to write the data to the buffer and send output to the client in response. out object allows us to access the servlets output stream and has a pagescope. out is the object of javax.servlet.jsp.JspWriter class. In servlet we are used PrintWriter to send the output to the client. In JSP we use JSPWriter. Every JSPWriter is associated with 8KB of internal Buffer. Where as PrintWriter doesn’t associated with any Buffer. The methods of the JspWriter class are designed to throw java.io.IOException where as the methods of PrintWriter class are not throw Exception. JspWriter is an abstract class present in javax.servlet package. PrintWriter is a class defined in java.io package. request implicit object is the object of type HttpServletRequest. request object will be created by the container for every request. It will be used to get request information like parameter , header information ,server name server port etc. By using request object we can able to set ,get and remove attributes from request scope. It uses the getPareameter() method to access request parameter. The container passes this object to the _jspService() method. response is an instance of class which implements the HttpServletResponse interface. Container generates this object and passes to the _jspService() method as parameter. response object will be created by the container for each request. It represents the response that to be given to the client. The response implicit object is used to content type, add cookie and redirect the response to another resource. config is one of the implicit object of type javax.servlet.ServletConfig. 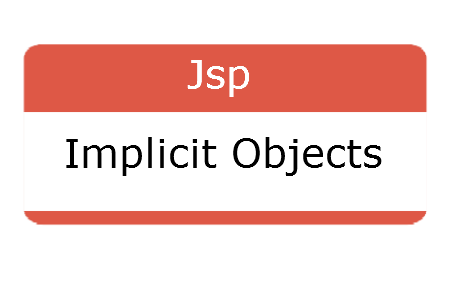 config object is created by the web container for each jsp page. config object used to get initialization parameters from web.xml file. servletConfig is an object used by servlet container to pass the information during initialization. Once if we get the ServletConfig object, we can find the name of the servlet which is configured in web.xml file by using a method getServletName() method. application is one of the implicit object of type javax.servlet.ServletContext. application object is created by the web container one per application when the application gets deployed. application object used to get context parameters from web.xml file. ServletContext object contains set of methods which are used to interact with ServletContainer. By using these methods we can find the information about ServletContainer. When ever sun micro system releases a new version of API. It is the responsibility of server vender to provide the implementation to the latest API. For example when servlet 2.5 is released Tomcat guys has provided the implementation and integrated it in Tomcat 6.0 the latest version of servlet API is 3.0 this version is integrated in Tomcat 7.0.
session implicit object is holding HttpSession object. session object used to set, get, and remove attributes to the session scope and also used to get session information. pagecontext implicit object is type of PageContext. Page implicit variable hold the currently executes Servlet object for the corresponding JSP. The implicit variable can be used only in Error pages. When we try to use this variable in a JSP which is not an Error page we get an Error message.